December 16th in Free Plug-ins by Wordpress Jedi . In order for your website to go viral online, you are going to need some decent content. But even having the best content in the world won’t guarantee you a decent amount of action on Twitter and Facebook. It is always helpful to rely on your readers to help you spread your content around. That’s where Simple Social comes into play. It’s a wonderful social bookmarking plugin for WordPress that adds a beautiful set of social sharing buttons to your blog posts. Simple Social as the name suggests is very simple to use. 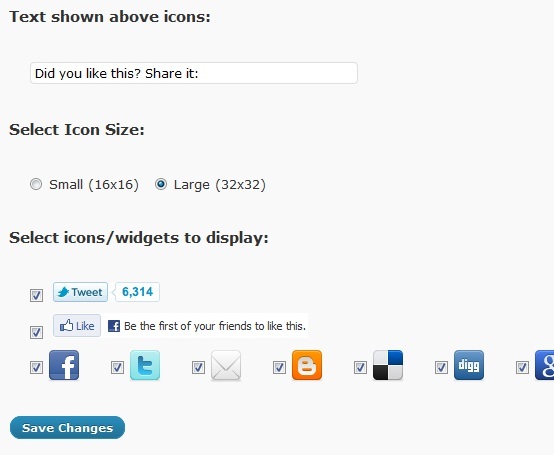 All you have to do is install it and choose the buttons that you want to display under your blog posts. You have got two sets of buttons to choose from (small, large). You can also customize the headline text for your buttons on the plugin’s settings page. Simple Social does what it promises without you having to write a single line of code. Please keep in mind that this plugin is not designed to have fancy bells and whistles. ShareBar, Digg Digg, and those types of plugins offer you more flexibility than this one. On the other hand, if you are just looking for a simple to use social bookmarking plugin, Simple Social can get the job done.